Immigrants who face growing uncertainty amid recent changes to programs that have granted them work permits and temporary protection against deportation are calling for permanent solutions from Congress before the end of the year. Nevada leaders are intensifying their call for Congress to approve a so-called clean Dream Act 2017, without obligations to fund a border wall in exchange for some 800,000 DREAMers gaining legal residency. They’re also asking for a legislative solution for those protected by the Temporary Protected Status program, which offers legal status to people whose home countries have been hit by natural disaster or violence but is being phased out. The petitions come after the Trump Administration announced the cancellation of the Deferred Action for Childhood Arrivals program and major modifications to Temporary Protection Status this fall. Although Democrats want a solution as part of year-end budget discussions to prevent a government shutdown, the leaders of the two parties and the president haven’t agreed to a solution. Immigration reform advocacy group FWD.us released an open letter to the state’s congressional delegation last week signed by 23 members of Nevada’s religious, business and political communities, including former Republican Congressman Cresent Hardy. It calls on representatives to protect Nevada’s DREAMers before 2018 begins. In a phone interview with The Nevada Independent en Espanol on Wednesday, Hardy, who is considering running for Congress after losing last year to Democratic Rep. Ruben Kihuen, said he supports DREAMers because of their economic contributions and because they were brought into the county by no fault of their own. Nevada Republicans who are currently in Congress are also speaking out about the DACA conundrum. During an event held by the LIBRE Initiative in Las Vegas on Dec. 2, Republican Sen. Dean Heller expressed his confidence that Congress will begin to review immigration policies and possibly reach a solution for DACA before the end of the holiday season. Rep. Mark Amodei has signed a discharge petition that, if signed by a majority in the House, could bring a DACA fix bill up for a floor vote even if House leaders aren’t cooperating. He also said Friday in his weekly newsletter that he had joined a group of 34 House Republicans to sign a letter to House Speaker Paul Ryan urging a fix for DACA by the end of the year. Amodei said that he was disappointed that the House had yet to take up a bill dealing with DACA recipients, and added that “continued inaction” was the wrong path forward. Joel Menchaca, who’s been pastor at the Amistad Cristiana Church of Las Vegas for 38 years, also sent a message of hope to immigrants covered by DACA and TPS. 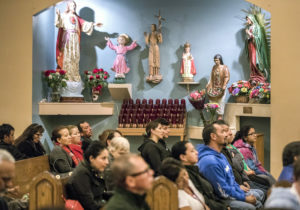 DREAMers attend his church. 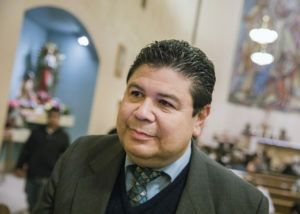 “Those who have faith (believe) and can help, support us with your prayers,” Menchaca said in an interview. Although Trump allowed six months for Congress to design a permanent solution and legislators have not yet initiated a formal debate on the subject. Democratic leaders met with Trump on Thursday to start negotiations that could lead to a solution for DREAMers, although a presidential spokeswoman said Trump reiterated that he wants immigration negotiations to happen apart from discussions on a year-end spending bill. 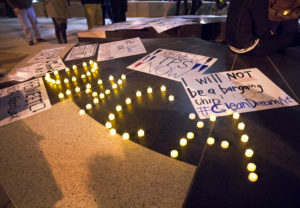 Meanwhile, progressive groups continue to hold events raising awareness, including a vigil outside the Lloyd D. George building in downtown Las Vegas on Wednesday. In Nevada, about 13,000 DREAMers are enrolled in DACA, a program that provides a Social Security number, a work permit and relief from deportation. Although the majority of DACA recipients — 548,000 — are from Mexico, approximately 60,000 beneficiaries are from El Salvador, Guatemala and Honduras, according to a report from Pew Research Center. Last month, the Department of Homeland Security (DHS) announced the end of that program for thousands of Nicaraguan immigrants, and two weeks later, announced the cancellation for Haiti. DHS said once the last extension for Nicaragua ends on January 5, 2018, there will be a 12-month period, until January 5, 2019, to allow immigrants to return in an orderly manner to their country. The agency also unveiled an automatic six-month extension for Honduras, indicating that no firm decision has been taken in regard to that country, while no decision has been issued for El Salvador yet. That was the main reason that Bessy Bautista, a native of Honduras who has been a TPS beneficiary for the past 17 years, attended a workshop last month that was organized by Hermandad Mexicana Transnacional. At the end of the event, Bautista, who works as an ambulance driver, said in an interview that TPS has allowed her to work and thus pay for her studies, but she couldn’t qualify for financial aid. Community leaders and activists are keeping up a steady schedule of immigration counseling workshops so that DACA and TPS beneficiaries can find out if they have legal alternatives that will allow them stay in the country should those programs go away. 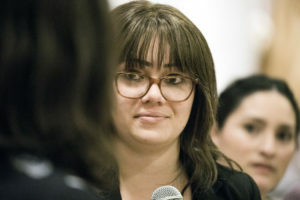 Immigration attorney Laura Barrera of UNLV’s Immigration Clinic said that there are some options, although not a whole lot of people would qualify for them. 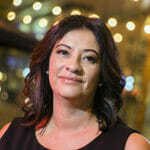 “Anyone with TPS who has a US citizen child over 21, or a US citizen spouse, they would be eligible for an immediate visa if that spouse or child does a family petition for them,” Barrera said in an interview last month at an immigration forum held at the Saint Anne Catholic Church in Las Vegas. Barrera said if TPS or DACA beneficiaries have been a victim of a crime, there’s a possibility of getting a U visa. If they’ve been a victim of domestic violence, that could be a possible U visa or a claim through the Violence Against Women Act (VAWA). She added that there are some possibilities through business. If somebody owns a business and can invest and create jobs in the community there are some limited options there. Tirso Sermeño, the consul of El Salvador in Las Vegas, said in an interview with The Nevada Independent en Espanol that his consulate is carrying out a series of events with immigration attorneys who provide free immigration advice to TPS beneficiaries. He said he remains optimistic that the federal government will realize the contributions the TPS community makes, not only to their countries of origin, but to the United States.